The influential Australian bank revised its earlier price estimates for iron ore and coking coal by a wide margin, citing an overall improvement in the Chinese economy, which consumes the vast majority of the world's steelmaking inputs. "The biggest discernible change in fortunes for commodities has been a lifting in investor sentiment towards Chinese demand, with the strong June macroeconomic prints — including the third-highest ever loans data — having presented a more robust picture of activity for the second half of 2017," Macquarie says in the report quoted by Business Insider. "After resurgent strength in commodities prices, particularly amongst the bulks, we upgrade our forecasts." Macquarie previously saw the benchmark spot price for 62% fines averaging $50 a tonne in the first quarter of 2018, but now estimates it will settle around $73/tonne – an increase of 46%. "Our prior forecasts assumed a more rapid closing of the discount for low grade iron-ore as the fall in benchmark prices was expected to be driven by both increased high grade supply and declining steel demand," the bank explained. "However, with the outlook for steel bullish for at least the next six to nine months, we have assumed the discounts for lower grade ore close more slowly than previously anticipated." Benchmark iron ore last traded at $76.08 a tonne, a slight dip from its Aug. 22 close of $79.65 a tonne, according to Metal Bulletin. 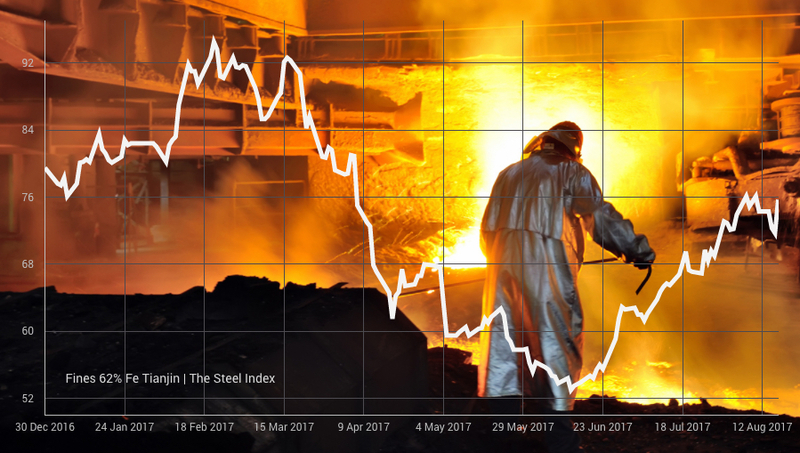 The bulk-shipped material has been on a tear since June when it was trading in the mid-$50s, largely due to increased Chinese steel production. China's steel production in July rose more than 10% compared to last year to a record 74m tonnes as traders worry about a steel supply crunch going into the new year. Beijing wants to cut output by as much as 50% during winter months to fight smog, particularly in its capital city and surrounding areas. In Hebei province, China's key producing region, steelmakers said they will comply with stringent new emissions regulations starting September 1. Some 120 million tonnes of low-quality steel capacity were shuttered during the first six month of the year. Meanwhile BHP (NYSE:BHP), one of the largest exporters of iron ore and coking coal from Australia, said it is optimistic going into 2018. “Based on our view that the steel market in China will remain tight, thus supporting mill margins, we expect (iron) ores at the higher end of the grade spectrum to perform well for at least the remainder of the calendar year,” chief commercial officer Arnoud Balhuizen said on BHP's website. Turning to coal, Macquarie said coking coal prices will also remain elevated for longer than it previously anticipated. The bank revised its near-term coking coal price forecasts by 32% and 40% in the first and second quarters of next year, respectively, to $185 and $175 a tonne. It said the upgrades were based on Chinese restocking demand and tight coking coal supply. “With the potential for voluntary supply restraint by major Chinese metallurgical coal producers, ongoing supply issues, Chinese port inventories remaining low, high land-borne logistics costs in China, and the potential for an accelerated rate of capacity closures in calendar year 2018, it is possible that metallurgical coal prices can sustain above long-run marginal costs for some time,” BHP's Balhuizen was quoted in The Australian.